Loved by all, the Happy Baby Pose is a powerful hip opener. It releases the sacrum and lower back, and it soothes the central nervous system, which includes the spinal cord and the brain. Also known as Ananda Balasana in traditional yoga, or the Stirrup Pose by some Yin Yoga teachers. The Happy Baby Pose is a very fun pose, as it's name suggests. Who hasn't seen a baby in this pose, happily playing with her feet, cooing and giggling? Despite the fun name, and the calming effects of this pose, it is still incredibly therapeutic when practiced mindfully, especially for those with lower back pain or sacroiliac joint pain. Remember that a mindful Yin practice includes deep belly breathing, noting the subtle shifting of your body sensations over time as it releases, remaining still and calm, setting your intention for your practice by committing to staying present, and perhaps saying affirmations/prayers that you need in your life. Begin the pose, by lying on your back and bringing your knees into your chest. Open your knees and take your feet into your hands. Slowly spread your knees until they are on each side of your torso, and your lower legs are perpendicular to the ground, as shown in the first photo, below. If you cannot reach your feet, you can use yoga straps, (one strap for each foot) or wrap your hands around your ankles, your calves, behind your knees, or whatever is comfortable for you. I am particularly fond of flexing the feet and pointing the soles towards the sky. Even if you are not using straps to help with the flexion, or if you cannot reach your feet, go ahead and still send your soles upward by flexing at the ankle. This movement helps you firmly set your knees under your feet, and aids in the downward motion of the lower leg over the knees. The action of the pose is to actively apply gentle pressure on the balls of your feet, to send your knees downward. You will use your biceps to do this. This is perhaps one of the few Yin Yoga poses to engage the muscles of the arms in a more yang-like fashion. Once you understand the action of the pose on your hips, you can also do this pose passively, by merely allowing the weight of your arms working with gravity, to send your knees toward the ground. While holding the pose for 3-5 minutes, you may wish to switch from active to passive, as your hip joints slowly give some more, and you no longer have to exert any pressure through the arms to achieve the desired hip joint opening effect. Remember that Yin Yoga's primary goal is to work deeper into the yin tissues of the joints, the tendons and ligaments. This can only be done slowly over time, exerting only mild pressure on the hips. For more information about the unique practice of Yin Yoga, click here. Do not try to make your knees wider in this pose, but keep them where they are comfortable. You may also feel a tug on your hamstrings, or inner thighs, but most of the sensation should be felt through your hips if you are doing it right. Don't forget to lengthen and ground your neck, with your chin pointing slightly toward your chest. If you have lower back pain, or sacroiliac joint pain, raise your tailbone by pulling your legs toward your head. This will slightly round your lower back and send pressure down through the sacrum. Notice if this relieves your pain. This pose should re-align the sacroiliac joint by decompressing it and making the pain lessen or go away altogether. You can experiment with various hand positions in this pose, like taking your big toe into your first two fingers, called your "Peace Fingers," as shown below. This is my own personal favorite. You will notice that by doing this hand position, your elbows will naturally want to go inside your knees. You may also try using your hands to hold through the insides, instead of the outsides of your feet (not shown.) Each hand position gives slightly different sensations in your lower back and hips and they can all be nice, depending on your body's needs for the day! Then, try to extend one leg and then another as shown on the next two photos. The leg extensions are more easily done in the Peace Fingers hold. This pose is sort of an inverted Half-Dragonfly Pose. The leg extensions will take the sensations from the hips to the hamstrings and inner thigh, a different pose altogether. Hold each side for 3-5 minutes. The Happy Baby Pose is also a mild inversion, where your feet are higher than your head, so if you have issues with feet swelling this should help. Inversions increase the flow of blood to the brain, so this pose can also be a rejuvenating pose. If you have foggy thinking, the Happy Baby Pose will soothe and rejuvenate your brain! In most yoga classes, the Happy Baby Pose is done towards the end, often just before Savasana. 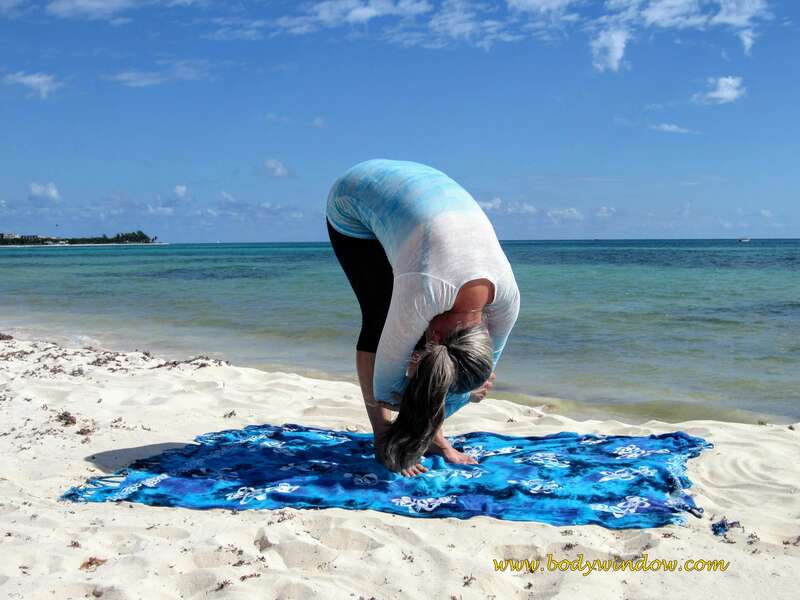 This is definitely a good rooting pose that stimulates and opens your 1st Chakra energy, with the entire length of your spine connecting with the earth. This is why it is important to keep your neck long and connected to the ground as well. In this pose, the lumbar curve is also lost, through the rounding and pressing down of the lumbar and sacral areas. This movement really decompresses the lower spine, which definitely makes this pose a "settling in" pose at the end of class. You may wish to again, hug your knees into your chest when you have completed your series of Happy Baby poses. You can easily do this pose as part of your bed yoga routine as well. If you follow up with the Raised Feet Pose, falling asleep may become easier for you, as all inversions calm the brain! May you find sheer joy, rejuvenation, and relief of your lower back pain when you do the Happy Baby Pose!